Research firm Chitika has come up with a new report that shows just how insignificant the sales of the Microsoft Surface RT have been, at least judging by the web traffic generated by the device. Chitika has measured that for the period between November 12 and November 18, the Microsoft Surface RT has accounted for just 0.13% of all web traffic generated by tablets in the US. Now, on one hand, that sure is one very discouraging figure, but on the other, the device hasn't really been available for too long. The combined share of Google's Nexus 7 and Nexus 10, which stands at 0.91%, is currently much bigger, but it's really not much more significant if we look at the bigger picture. In comparison, the iPad is said to be responsible for 88% of all tablet web traffic in the US. Of course, having in mind the short period observed by Chitika makes us think that the research might not be entirely trustworthy, but it's a fact that there's still a long road ahead of Google, let alone Microsoft in the tablet race. Who knows, maybe people are waiting for the Surface Pro? Drop the price..... And it will sell. Or it may already be selling well. I guess Surface owners prefer to play with the snappy kickstand to sufing the web. The "click" sound that the kickstand makes just feel too great LOL. Lmfao!!!!!! That's very true. All Microsoft advertise in the commercial is the click sound. I know I'd buy it if the price went down! I agree. The lower priced Android tablets are the ones selling. MS might have to take this apporach. Some Android tablet manufactures arent really making a profit, but they are getting their product in folks hands and making the money back elsewhere. Seriously, why are you getting all tingly because of someone's failure? I'm not taking side of MS or anything but whole basis of your comments is Hate. Don't you care how silly you look to the people while posting such comments? Are you a kid? That brought a tear to my eye, troll. Surface Pro will sell better than this. Much better IF PRICED RIGHT. MS made a mistake pricing the RT version so steep. Surface Pro price is already known even if not official. And at $900 the cheaper option (64 GB) I doubt it has any real chance of success. Not to mention that the battery lasts less than 4 hours, which (IMO) it's a "no deal" for a tablet. That's very true. However, it is not meant to be a tablet exactly. Microsoft is selling it at a very competitive price for ultrabooks, especially since it's backed up by 4GB of RAM and Intel's 3rd Gen i5 processor. It is significantly more powerful than the most powerful tablet on the market. It is confusing however because of it's tablet form-factor. Microsoft's marketing isn't helping either. People will automatically see that the iPad or the Nexus 10 are significantly cheaper. They'll see that the Surface RT is cheaper also, so why don't they opt for that. Well if the Pro is priced at a premium, why would they want to settle for second best. They will quickly assume that microsoft prices it's products higher. For the average consumer, this is extremely confusing. Btw, 4 hours is great battery life, considering it's basically a laptop with a touchscreen and no keyboard. Not to discuss most of what you said, but there are some holes there. Ultrabooks have quite limited sucess (21 millions in a year last time I checked) so if it competes on a market that has already low volumen, the doom is pretty much garanteed. The other issue that I see with the "tablet" is the form factor: a) Too heavy and bad battery for a tablet b) Not comfortable for an ultrabook (you can't use it in you lap while traveling as I'm doing with my laptop right now) So it may be just me, but I find it overpriced and with no real use case to sell in volume. Your comment made me smile. I actually was going to say "it brings the worst of both worlds instead of the best" in my previous comment. You make a good point about the Surface tablet running windows RT vs the Pro running Windows 8. However, i thought the Pro would just be running 2 gigs of RAM. I am happy about this though, and do plan on buying a 128 gig Surface pro when they come out. I like the idea of the removable keyboard plus the ultrabook and portability of it. 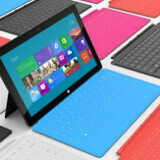 There will be better more affordable windows 8 tablet/transformer tabs made by other companies. Why do you prefer microsofts? It would be a shame if it ran anything less than 4GB, especially since most laptops at that price have 4GB and even more at times. I do suggest that you wait to see some other options, especially when lenovo already introduced a better laptop, the lenovo thinkpad twist (check it out). Unless you really do prefer the keyboard to be removable. then you should opt for the Surface but I do believe that if I were a fan of windows 8, the Lenovo thinkpad twist is the laptop to get for now. Looks like Asus is going to release something better than both of those tablets so you probably should hold off and wait a couple of months or so. Sure you don't mean dumb CEO? This is so misleading. iPad web traffic is calculated by viewing mobile sites, is it not? In that case, Android users can easily view desktop versions of their favorite sites, which contributes to these skewed numbers.